This comic was originally created in support for Rachel Swirsky’s project to confound bullies by raising money for LGBTQ healthcare through her Posteriors for Posterity month on Patreon in May last year. This is the comic we created for the $500 stretch goal and was originally only available to Rachel’s Patreon supporters. We were so delighted to be part of the project. Thing 1: We don’t have legs, so we don’t have bottoms! Thing 2: Our bottoms are the bits that most frequently touch the ground. We need a bottom, so we can have a top. 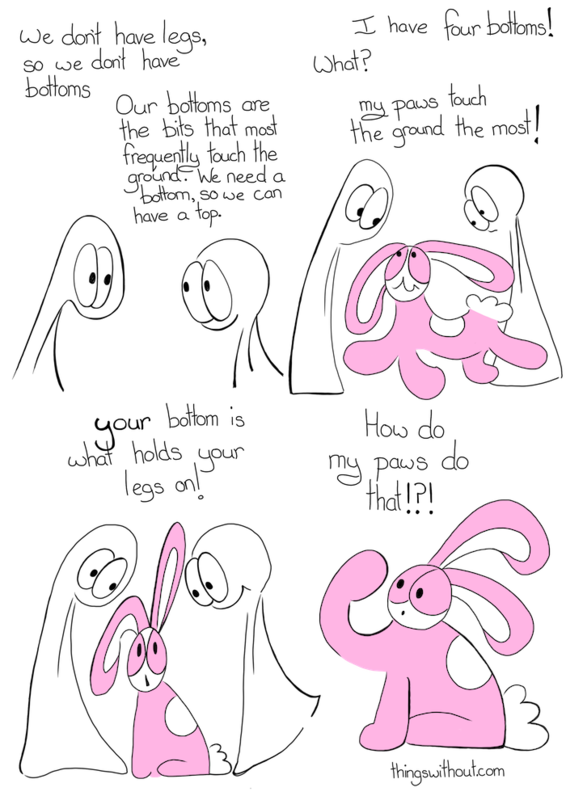 Bunson (a small pink bunny, he liked dancing, friendship and cake): I have four bottoms! Bunson: My paws touch the ground the most! Thing 2: YOUR bottom is what holds your legs on! Bunson looks at his paw: How do my paws do that!? !